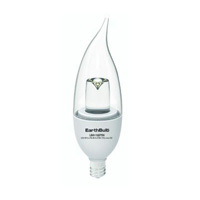 4.7 watt Candle style EarthBulb LED bulb provides 315 lumens and replaces 40 watt incandescent candle bulbs which may provide over 80% energy savings. 2700K color of light is standard. Great for use in Chandeliers, decorative lamps and wall sconce applications. Multi-Chipset LED and an advanced cooling system provides for 25,000 hours of LED life. E12 base type. Energy Star rated product on the Clear Finish only.